Mae Dowlin was the only daughter of Luther Dowlin of North Wales. Trego posed her seated in a large red upholstered chair, wearing a long-sleeved dress with voluminous skirts. 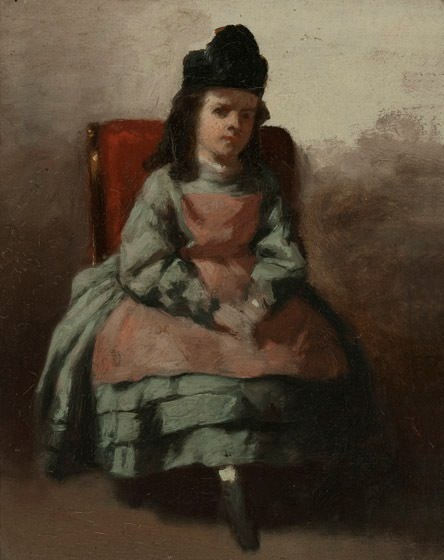 Unlike the study of her brother, Clifton, which is a very simple sketch, the study of Mae is quite detailed, with delicate modeling of the folds of her dress and even a glint of light reflecting off the polished wooden frame of the chair. However, while Trego painted finished portraits of the youngest Dowlin child, Norris, and both Luther Dowlin and his wife, Martha, he does not seem to have created finished portraits of Mae or her brother, Clifton. The reason for this is unknown. This study was commissioned by Luther Dowlin, father of the subject. It has been passed down through the family of his descendants and is currently in the possession of Mae Dowlin’s grandchildren. The painting is framed under glass and appears to be in good condition.